When watching this short film - please - receive it into feeling - please, let it bypass, unimpeded - into feeling. It is a film about you - you and me - our reality. Please receive it into your reality - into your being. It attempts to depict creation in a really simple way, using the abstract visualisation of number - thereby avoiding all sectarian or partisan division. In such a way, it is hoped that ideas themselves can be represented - fundamental & critical ideas, devoid of any particular bias - and as such, the reality behind the ideas can be seen with a profound clarity. After all - ideas are the inspiration for everything. Simple, two-dimensional geometric shapes have been used at times to help illustrate the basic simplicity of these ideas - however, it must be respected that even the ideas behind these shapes themselves - do have a reality - and that reality owes its existence to the one, fundamental conception - the mysterious probability of which we are a part. It must be said, that the story of creation is often framed as an "In The Beginning" story - and perhaps this could be due to our incapacity to frame outside of a reference to time. We cannot conceive of an "Always." However, the basic implications of this film do not ultimately depend on either "Always" or "A Beginning" - as the majestic conclusions are the same in either case. I wish to present some of the content for further evaluation. The film starts with words, against a white background - to suggest that we are witnessing an un-manifest singularity, which cannot "de-exist" - but which represents all potential. The film labels this singularity as "One" - but in the sense of "All" - not yet in the sense of number. Because this potential is so obviously a reality, "One" is more appropriate than "Zero." 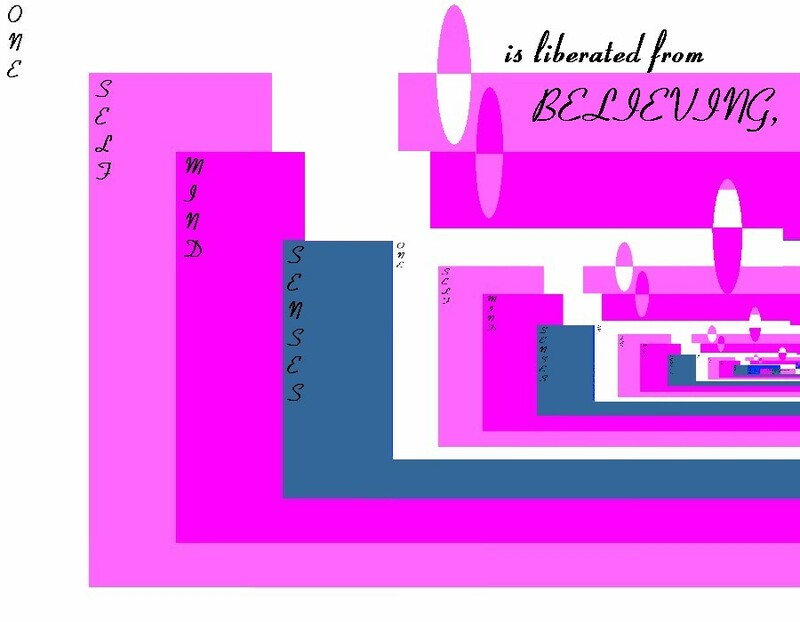 Words carry meaning - a meaning which illuminates an underlying reality, a reality which can best be understood by feeling combined with intellect, rather than by intellect alone - so please try to connect the words to the enormous significance of their underlying reality, the meaning that they carry - the meaning which is being expressed by your very being - right now. Only then will you be able to perceive the significance of "two" - being only an idea in the mind of One . . .
. . . by seeing the significance of the One, and the sublime originality & portent of this idea of two. Remember - we are discussing reality - ideas on a universal scale - and quite reasonably, we will continue the questioning . . .
. . . questions that mankind has been asking - probably, since mankind. The true answer to these questions being only discernible from the perspective of the One - from a perspective where they are no longer even questions. So - from the perspective of the One - two cannot possibly be a reality - it can only be an idea, but this idea is the inception of the idea of number - the inception of an infinitely re-creative process. This is itself an enormously profound inception - an idea within which, One itself becomes transformed, from a purely qualitative being - into a quantitative idea - an idea which when extended beyond One - conceives identity - the very possibility of other ones - of other realities - but, only as ideas in the mind of the One. The idea (but what we perceive as our reality) of quantity, allows us to sum one & two - arriving at three - a new & third idea - our perceived reality of relationship - born automatically with the inception of two. However, the potential for identity, for other ones, cannot be realised - therefore relationship itself cannot be realised - if "two" retains its self-knowledge as One. So there has to be a process of forgetting - of de-science - a descent from omniscience. "The nature of the One is hidden in the nature of the One's appearance." A process which leaves identity up-for-grabs - available to the highest bidder, or shall we say, to the most convincing paradigm. Nevertheless - the question of identity only occurs in the realm of mind - the realm in which it was conceived - the mind of the One. It is only a matter of mind, not a matter of substance - it is the matter of ideas, not of being. 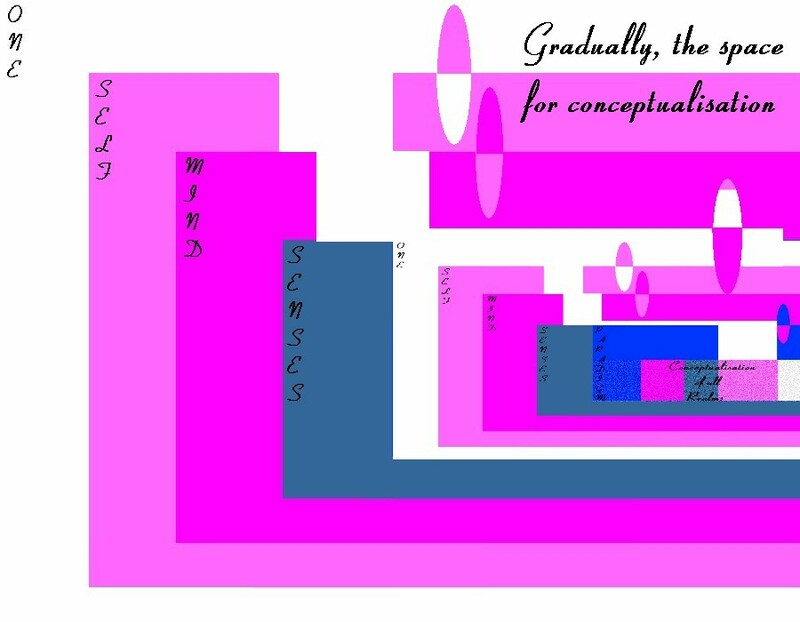 Which brings us nicely to some of the other graphics - importantly, this one - where we can visualise our paradigm (the conceptual realm) - and notice that all other realms are conceptualised within this realm. Strangely, there is an anomaly in how we interact within our own paradigm - which appears to invert our notions of abstract and concrete. Convinced, as we are, that the nature of reality is "concrete" and that the nature of our thoughts is "abstract" - however, close observation will reveal that realistically, it is the other way around - and that from a fluid and emergent "abstract" reality, from a continuum - we elect immovable and concrete "concepts." Our thoughts, our opinions, although abstract and insubstantial in themselves - do have an irreducible and concrete effect upon our being - in both our unconscious and conscious interaction with ourselves and our environment. An effect which is by and large influenced by the imposing nature of our senses (the perceptual realm) . . .
. . . resulting in our conviction of a concrete world - but a conviction which conveniently belies the constant and imperceptible change, happening in and around ourselves. A conviction that belies the stark realisation that we ourselves are not concrete entities, on either the physical or any other level of existence. But, a part of our very own paradigm is our concrete conceptualisation of "self" - a collection of references from our fixed perspective. This is distinctly at odds with the nature of everything - which is change - emergence - process. Close observation will reveal that this "phantom self" - is the product of everything contained within "The nature of The One's appearance." In other words - it is the product of our existence within the mind of the One - it is concomitant with the possibility of identity, bequeathed to us by the One. Relationship and identity also give us the idea of four - ME & (you) - (you) & ME - for anything existent. However, also making an appearance within our paradigm - is a conceptualisation of the One - which transforms it also from being fluid & emergent - into being objectified - compartmentalised and concrete, alongside our conceptualisation of self - making both concepts available to our attention, but in parallel with all of our other finite concepts, and with a degree of understanding consequential only to our relative paradigm. We can see how this objectification succeeds in denying us the awareness of the One omnipresence, omnipotence and omniscience - by objectifying it, we are excluding it - exactly the same process that we apply to ourselves. What tends to be overlooked in all of this - is the degree of liberty bequeathed by the One - a liberty, not only to usurp identity, but the liberty to recreate - in infinite quantities - but that also appears to be a part of the plan. It is the complete generosity of this liberty, a creative freedom unsurpassed, a love so total and all-encompassing - which grants us our autonomy of mind - our free-will - only limited by the constraints of relativity, the fourfold sphere in which this is all unfolding for us. However, it is only an autonomy of mind - not of substance or of being - we cannot really create, only re-create - and only conceptually, with ideas within the paradigm - which is our "overall idea," our understanding thus-far - of ourselves and our environment. Attention to our being will confirm that our basic nature, the root at the inception of identity - is awareness. Wherever we place our attention - it is our intention which channels our attention - but that attention, wherever it goes - is a focusing of awareness. As such, it can safely be said, that our attention can never escape our being - our being is confined within that attention, our being only exists within that area of attention - that area of attention defines our being. Directing this attention within the paradigm (our conceptual reality) confines our awareness to this paradigm, where we find that this awareness itself is entirely entwined with and identifies with the conceptualised self within that paradigm. The profound subtlety and silence of awareness itself is obscured by the noise of thought, by the imposing presence of gross and subtle mentation, as if the concreteness of thoughts themselves provides an attractive mass which magnetises and imbues our awareness with its own identity. Our awareness habitually is attached to the concrete phantom of self - and thus can only interact with the paradigm, from within the paradigm itself. So - in order to start again, in order to re-align the paradigm with reality - we need to extract ourselves, our awareness, from the existent paradigm. When we start to do this - we discover that our awareness has no shape, it does not occupy a space, it is fluid but unchanging in its nature - we discover that it seems to be searching for an identity, but it can only find choices within conceptually concrete ideas. In other words, its search for identity tries to be satisfied by any idea that appears in the realm of mind - this awareness, which is at the root of itself - is searching for its own identity - but from a realm that is within itself. Rather akin to a tree identifying with a leaf. It is searching within the content of The Experiential Realm, for the identity of itself, the very thing that gives rise to The Experiential Realm. Without awareness - The Experiential Realm, or any of the content, could not exist. However, when we observe closer still - we find that the origin of the search, the quest for identity - stems from the residue of the phantom self within the paradigm - attempting to concrete itself, yet again. Awareness has been in such a close association with this local perception of self - that it has temporarily forgotten its own nature - which is totally abstract, and can be known only to itself. A true "identity" basking in absolute liberty, saturated with pure potential - an identity restricted & limited only by the very same search for identity induced by imprisonment of the self within the paradigm. Self (the true identity) cannot recognise its own true nature by appealing to The Experiential Realm. The Experiential Realm will only contain reflections, conjured up (conjure means "with the law" - in this sense, within the constraints of relativity) by its own existence. Yet without this Experiential Realm, the quest for identity would not arrive - the question would not and could not exist. Without the hiding and the forgetting - within itself, the One would have no cause to ask the question of itself. Which is why it has to be a real hiding - a real forgetting - and it can only be real (from the perspective of the One) if the awareness of this hiding and forgetting is known by the very same conscience (knowing) as the One. Hence - in its purest state, uncluttered by any other reflections of itself (the hiding) - the Self is aware that its true identity is none other than the One - the un-forgetting. The Experiential Realm, within The nature of The One's appearance, can start to experience its nature as it really is . . .
. . . the process of liberation can commence, liberation from definition, from identification with the finite, with appearances, with concrete concepts & from the quest for any identity whatsoever. Liberty to avail of the whole of the mind of the One - not just a small prison of confinement. Represented graphically by a paradigm of reality, a paradigm of "self understanding itself," the bigger picture emerging - a paradigm that gradually approaches infinity and eternity. Hence the plea to receive this into feeling, your whole being - & not just the intellect.